Most people around the world associate Russia with frigid winters. They picture people wearing fur coats, shapka-ushanka hats and valenki felt boots to struggle through impassable snow-covered roads. Yet there’s so much more to love and discover about Russian winter. Seeing the natural phenomenon Aurora Borealis in real life is by definition a memory built to last a lifetime. Although there are many spots throughout the world to catch this kaleidoscope of colors in the sky, few know that the best display can be found in the small village of Khatanga in northern Krasnoyarsk Territory. Among the country’s northernmost settlements, Khatanga’s latitude makes it favorable for nature’s most unforgettable light show. It is an authentic place for adventure seekers too, as reaching Khatanga is an adventure in itself. The best time of year to see the night sky’s colorful decorations is December and January, when the sky experiences the most activity. Since time immemorial Russian banyas have been believed to contain healing properties and are still a popular activity among locals. The unique atmosphere in traditional Russian banyas owes much to the natural logs used to reach the necessary temperature in the “parilka” steam room. The room fills with the pleasant natural scent of wood and water from buckets is continuously poured over smoldering rocks, enveloping the room with a dense, dry steam. Don’t skip the ritual flogging with white birch or oak tree branches soaked in hot water. A visit to the parilka is followed by another exciting ritual: Running from the steam room and jumping into the adjacent snow banks, although some prefer to take a simple dip in a cold pool. Sochi’s Krasnaya Polyana ski resort offers visitors the best winter banya experience, inviting guests to a traditional tea ceremony after a steam to drink handpicked tea with a picturesque mountain view. The southern Urals is among the finest regions in Russia for a winter holiday. Encompassing vast valleys and covered with a glimmering blanket of crystal-white snow, the Urals are renowned for their breathtaking horse-sledding journeys. Sleighs harnessed with robust stallions pass through the snowy ridges of Kraka-Tau and the Bashkir National Reserve, revealing views of Russian plains, stunning natural scenes and traditional architecture. These trips can last up to seven days and include staying in an “izba” (log hut), preparing dinner in traditional Russian “pechka” ovens and tasting natural honey. Optional activities include hiking to a holy spring, snow tubing and horseback riding. The multiethnic Kazan region in Russia is renowned for its annual celebration of Nardugan, a centuries-old pagan holiday honoring the winter solstice. According to the ancient Tatar calendar the Sun’s birthday is on December 22nd, when the days begin to get longer. The festive weeklong celebration starts on this day and symbolizes the awakening of nature and the triumph of life. During this week locals bake pastries, tell fortunes using rings and put on theatrical performances. The door-to-door traditions of this celebration are also quite festive: Adults and children dress up in costumes and masks and stop at neighbor’s houses. They dance and sing songs accompanied by harmonicas and wish people health, wealth and happiness. Lake Baikal is the world’s deepest lake and remains a real mystery. Despite its enormous size it freezes completely and its meter-thick ice remains crystal clear, making a jeep-ride atop Baikal a must-do experience. The areas not covered by snow are a real wonder: The incredible topaz-blue ice reveals the beauty of the underwater world providing travellers with the opportunity to look at its depths as if through glass. Other works of art created by nature include the “splash-spills” formed by the lake’s splashing waves, which freeze while trickling down the massive rocks on the shore. The splash-spills can be up to 10 square meters in size often hiding caves and ice grottos accessible only in winter. Another treasure of the region is Olkhon Island, a sacred shaman territory that supposedly emits positive energy and power. 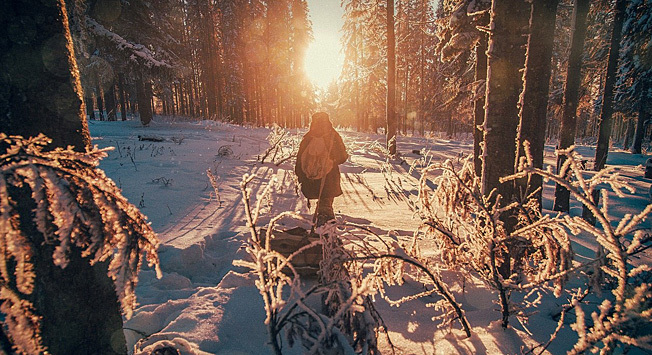 Russian winters are what fairytales are made of and one can fall in love at first sight. It is the most adventurous time of year for making enriching cultural discoveries and creating memories to last a lifetime. About the author: Ivan Shirokov - Senior Destination Specialist at Travel All Russia - has traveled the vast expanses of Russia far and wide and can help plan your unforgettable Russia tour this winter.